A phenomenal new advance in minimally invasive stitch-less abdominal surgery for appendix and Bariatric Procedures. 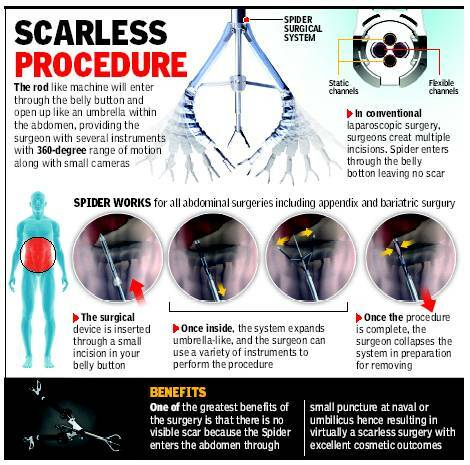 Surgeons at SafeMedTrip affiliated hospitals in India have now started to use what is called a spider technology — a single flexible laparoscopy instrument that will do away with the need for five incisions for any abdominal intervention. Instead, the rodlike machine will enter through the belly button and open up like an umbrella, providing the surgeon with several instruments with 360-degree range of motion along with small cameras. This new advanced technique uses a spider technology that does away with the need for incisions for abdominal intervention. A rod-like machine will enter through the belly button and open up like an umbrella, providing the surgeon with a 360-degree range of motion. 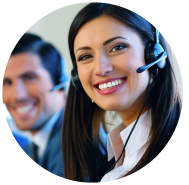 Once the procedure is completed, the system closes up and is removed through the same incision. The greatest benefit is that there will be no visible scar because the ‘spider’ enters the abdomen through a small puncture at the navel. In conventional laparoscopic surgery, surgeons place multiple incisions (five scars) in various parts of the abdomen to utilize several specialized instruments to achieve the necessary angles and access critical anatomical areas. “This new technology is also hygienic as the instrument is disposable and for every new patient, a new instrument is used. “Lesser scars will mean lesser pain. Patients who receive a spider surgical procedure may experience less scarring with the potential for limited post-operative pain and a fast recovery to normal activities. We will put a water-proof dressing on the belly button after the instrument is taken out. There will be no stitches,” he added. In the 1990s, many surgeons began transitioning certain procedures from large, open incisions to multiple, smaller incisions through laparoscopic surgery. The surgeons had to learn an entirely new technique for performing complex surgeries, but the benefits of less invasive procedures drove many surgeons to embrace this technology.